Oprah Winfrey's long-time best friend, Gayle King, said the talk-show queen and her half sister, Patricia, are off to a "great start" getting to know each other. "As someone who's been in the position of reuniting people ... for her to be the person that's being reunited was certainly a big shock to her," King said. "She wants to get to know her she says, woman to woman, and try to see where it goes, but she is certainly open to having a relationship." Winfrey's half sister, Patricia, a single mother of two, had been given up for adoption in Milwaukee, by Winfrey's mother, Vernita Lee, in 1963. "I was 9 years old at the time of [Patricia's adoption], living with my father in Nashville, Tenn.," Winfrey said on her show. "I had no idea my mother was even pregnant." Patricia, whose last name was not revealed on the show, said she first discovered her link to the media mogul in 2007, after years of searching for her birth mother. Patricia and her children's decision not to sell the story to the media and to keep the secret for years before meeting Winfrey meant a lot to the media mogul, King said. "This is extraordinary that somebody would have this information about Oprah, who as you know has been sold out on many occasions by friends, by co-workers, in some cases family, with stories that weren't as legitimate as this," King said. "Patricia wasn't trying to get Oprah, she was trying to find her mother ... having Oprah as a sister, a half sister, was a bonus." Lee, Winfrey's mother, kept the secret of the adoption for more than 40 years, even denying the truth when Patricia first approached her. Winfrey told King that the revelation helped her see her mother in a new way. The two have had a tense relationship in the past. "Vernita, of course, kept this a secret from everybody. Even when Patricia came forward, Vernita was still denying it," King said. 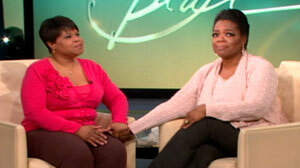 "She [Winfrey] said in that moment, talking to Vernita, she realized that she was still holding onto the shame and to say, let it go, release it, we support you, we believe you. What a gift she has given her [mother]." This morning, Winfrey took to the Internet to see her audience's response to the family news that "shook her to her core," and left her "speechless." "I talked to Oprah early this morning. She's been up on Facebook, reading all the responses and reading the reaction to the show and what is surprising her is that this has happened to a lot of people," King said. Family psychiatrists say that not all who are faced with family secrets accept the news right away, if ever. Although Winfrey was introduced to a blood-related sister, she may also feel more of an acquaintance or, at best, a friendship with Patricia, Belkin said. "Siblingship is an emotional feeling as much as it is biological feeling. You can have a sibling relationship with someone who's not related with us, and we can have a sibling whom we feel no relationship with," said Belkin. While Winfrey seemingly embraced her sister within a few months of knowing her, Belkin cautions others to take as much time as they need to decide how they will proceed once they know the truth. "People love Oprah and care about her, and I think you know there's going to be pain involved," said Belkin. "And what she can do is what she's always done -- use this to help other people." On her show Monday, Winfrey made it clear that she wanted to be the one to tell the public her family secret. "Needless to say, it's something you need to process when it happens, and my family and I agreed that we wanted to do it on our own terms and not have it be some big tabloid spectacle," Winfrey said. Mary DeMuth, author of "Defiance Texas Trilogy," a three-book fiction series on family secrets, and a memoir, "Thin Places," said that people today are much more willing to share secrets freely. "Nowadays people are much more apt to authenticity," Demuth said. DeMuth's research into family secrets led her to create a blog where people can anonymously write about their family secrets. Since its inception in 2009, the blog has had nearly 300 postings of secrets revealed. "People react to situations differently," she said. "When you have chaos in the household, when you have one more thing thrown at you, it just didn't soak in for me." Until then, Fontenot had no idea her father had a son from a previous marriage. And it wasn't until nearly 20 years after that brief introduction that she decided to reunite with her stepbrother. "I was curious to know what he would be like. For some reason, I really, truly was hoping that my father would build a connection with his son," said Fontenot. But it wasn't easy to build a relationship with her stepbrother. And although she still sees him occasionally, she said she's unsure whether it brought the closure she thought it might. She feels much closer to her other siblings, with whom she was raised. "When you haven't been raised with a sibling, there's not those connections, those memories and experiences you go through in life," she said. ABC News' Lara Salahi and Emily Friedman contributed to this report.